The pristine waters, jagged mountains, and charming towns of Alaska make it one of the most photogenic travel destinations out there. That’s why we’re thrilled to be cruising there in 2019! Guests joining us on these much-anticipated voyages will be making memories to last a lifetime. And what’s the best way to remember a vacation? Through photos! The best vacation photos have the power to transport you back to a destination in an instant. If you’re not sure how to take a good travel photo, don’t worry. These days, you don’t need to be a professional to take good pictures. 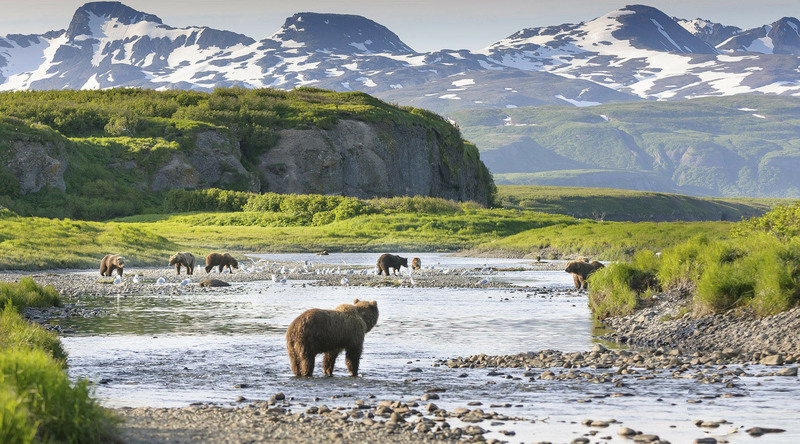 Here are ten easy tips for taking incredible photos during your Alaskan adventure. 1. Pack your camera – and know how to use it. How are you going to take the perfect vacation photo without a camera? When traveling, always keep your camera with you. You never know when a great photo opportunity will present itself! Often, you’ll get the best results using a camera you know well rather than a fancy camera with bells and whistles you don’t understand. This could even be the camera on your smartphone. As long as you have a camera with you, you’ll be able to capture the beauty of a destination. After all, in the age of digital photography, it’s better to have too many options than none at all. 3. Keep composition clean and simple. There are so many stunning areas in Alaska, it can almost be overwhelming to try and capture the beauty. Don’t pack too many things into one photo, as it will make it look messy and unclear. Keep the “Rule of Thirds” in mind when you’re taking a photograph – you can even add a grid to your iPhone camera to aid with this. Include only one or two points of interest in your photo, and try to position them on the grid lines or intersections. The human eye naturally gravitates to these areas of a photo. Follow the Rule of Thirds, keep your photo composition clean and simple, and your Instagram feed will be sure to impress! Beautiful as they may be, sunny days can make it difficult to take a good photo. Use light to your advantage to get the perfect vacation shot! Bright sun can result in pesky shadows. The best way to eliminate them is by using the flash on your camera. The flash places additional light on your subject, creating more exposure and lessening dark shadows. When photographing a person, position them facing away from the sun. This way, they won’t squint in the photo and you’ll avoid harsh shadows. If you can, seek out a shady spot to take your photo. If there are a few gray days during your voyage, don’t feel dismayed! Cloudy skies provide soft, diffused light that’s great for taking photos. 5. Understand when to use HDR. HDR can be one of the most useful features on your camera if you understand how and when to use it. HDR stands for “High Dynamic Range” and can help improve the exposure of your photos – especially if you’re snapping vacation pics on an iPhone. Turning on your HDR function will help you capture more detail in both the darker and brighter parts of a photo, especially when snapping pictures of architecture or landscapes. With such photogenic landscapes, this feature is sure to come in handy when cruising in Alaska. On an iPhone, you can opt to save both the original and HDR version of a photo. This way, you can later select the version that best captured the scene. 6. Get ready for your close-up. If you snap a photo and feel your subject isn’t standing out, try taking a step closer. A good rule of thumb is, “zoom with your feet, not with your camera”. Before you rely on the zoom function, try getting up close and personal with your subject. Of course, this might not be possible if you’re trying to capture some of Alaska’s incredible wildlife. If you must zoom, keep the camera as steady as possible when you shoot. A small, portable tripod can help. 7. Shoot during Golden Hour. Golden Hour happens twice a day – it refers to the time just after sunrise and just before sunset when the lighting is soft, warm, and flattering. This perfect lighting can’t be replicated and professional photographers simply love it. Luckily, Azamara ships often stay late in port, giving guests plenty of time to capture the magic of a destination during Golden Hour. Take advantage, and capture cities like Juneau at their most beautiful! 8. Don’t be scared of black and white photos. The rugged, natural beauty of Alaska alone will result in a stunning photo. Alaska’s emerald trees and sapphire waters make for vivid landscape shots. However, a black and white photo can be even more dramatic. Don’t be afraid to play around with editing features. Experimenting with black and white photography just might lead to your most artistic and memorable vacation photo! 9. Get in the photo. There is nothing worse than putting together a vacation photo album and realizing you’re not in any of your shots. Use your front-facing camera so you can adjust your positioning. You want to capture yourself and the scenery behind you. Rather than centering yourself in the shot, play around with positioning yourself to the left or right. Use the auto-timer feature. This will help you keep the camera still, as you won’t have to press a button to get your shot. Use a wide-angle lens to capture more of the scenery around you. A GoPro or clip-on lens like the Olloclip will work. Hold the camera slightly above your head for the most flattering angle. When you’re taking a lot of photos, it’s easy to rely on the same technique every time. Don’t get stuck in a vacation photo rut! There’s so much beauty in Alaska, you’ll want to capture it in the most creative way possible. Play around with the features on your camera, experiment with different angles, and look for unexpected subjects to capture. There’s no harm in trying new things! You can always delete photos you don’t like later. We always say, “If you want to take better vacation photos, take better vacations.” A voyage through Alaska with Azamara Club Cruises will be the best vacation. Learn more here.